Mix all dough ingredients with an electric mixer. Cover the dough with a towel and let it raise for 50 min at room temperature. Mince well the feta with a fork. Mince onions in fine pieces. Mix onions with feta cheese. Make little spheres from dough (egg sized) and stretch them with a rolling pin. Add 2-3 spoons of cheese and onion filling and close the filling inside in dough. Turn the sphere with the closing down and stretch it again with a rolling pin to obtain a little pie (15cm diameter, ~1cm thick). Repeat until all the dough and filling is used. Heat a pan and oil it just a little. Fry the pies 4 minutes on each side. Mhmm, these look fantastic! 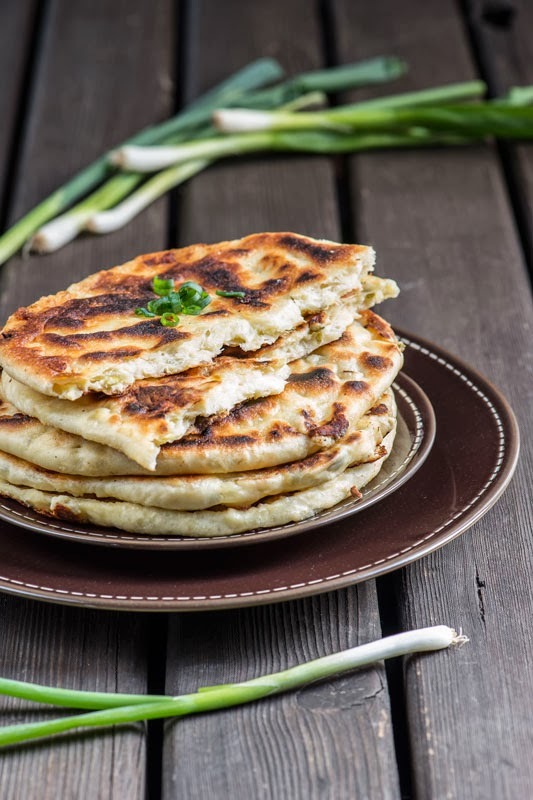 Would you say, they are similar to flatbread or indian Naan bread? or rather pancake-like? However, I will definitely try them out soon! I would say that they are more a flat bread. I don't know about indian Naan bread but they are not for sure pancakes. Try them, they are very practical and tasty.